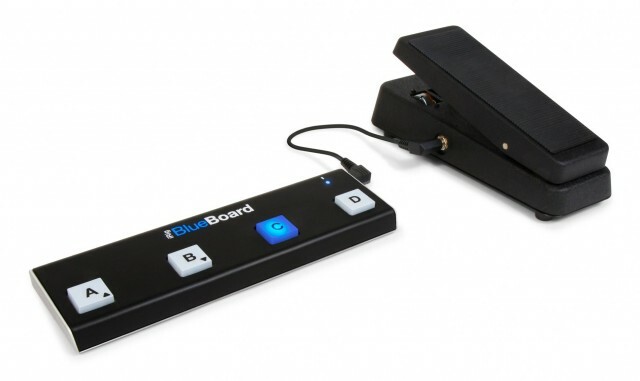 BlueBoard is targeted at iOS, but supports recent OS X laptops and minis, as well. That means wireless switches that light up, plus jacks for expression pedals. Singers or instrumentalists have plenty of brilliant-sounding apps these days running on iOS and Mac. But unless you plan to strip off those socks and play with your toes, you might want a stomp interface. 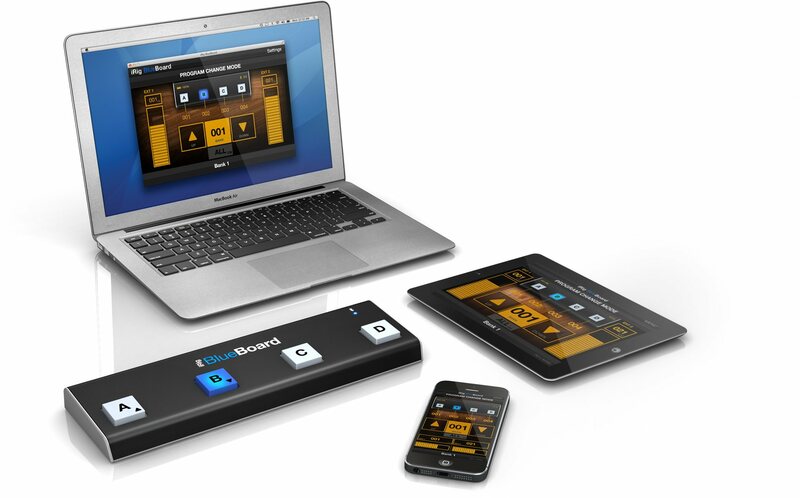 IK Multimedia’s iRIG BlueBoard could be an ideal solution for Mac and iOS mobile users alike, a $99 wireless box that adds four switches and two expression inputs. But Dock Connectors and, worse, docks, seem an invitation to obsolescence. And they don’t work with the Mac, either. Italian maker IK Multimedia has come up with what seem to be cleverer solutions. Having been the company that led the charge to convince guitarists to use their computers to model amps and effects with AmpliTube, they’ve had an aggressive accessory and app strategy on iOS, including a range of free apps (you only pay when you want to add more models). iRIG STOMP, their earlier offering, is simple but effective. The idea: swap out the minijack for jack plugs, and add a metal bypass footswitch and volume knob, so you can add an iPhone/iPod touch effect to your existing floor rig. Since it just uses audio connections, no control connection is needed. For more than one switch, IK announced a Bluetooth-based, four-switch solution at the beginning of this year, but they’re just now shipping it. It represents a long-overdue move to transmitting MIDI over low-energy Bluetooth 4.0. This isn’t a proprietary controller: it’s just a generic MIDI controller transmitting messages over Bluetooth. As such, you can use any app that can receive MIDI messages. That includes, IK is quick to point out, AmpliTube, VocaLive, SampleTank, iLectric Piano, and iGrand Piano. But it also includes even rival apps, including Apple’s own GarageBand. IK has dropped the nice metal footswitches found on their iRIG and other interfaces. But the good news is, using rubber pads instead means you can get light-up feedback behind the switches, so you know which effect is active. And while you might initially be disappointed that there’s no expression pedal, that’s a good thing, too. Not one but two TRS jack plugs on the back let you add your own expression pedals, which I think is a whole lot better than having one molded into the design. Nerd break here: I’m actually rather eager to see if we can use this as a simple way of loading audio effects in Pd on Android and iOS, stompbox style, and it should be equally useful with desktop. 4 AAA batteries for power. What you need is something with Bluetooth 4 support. That’s iPhone 4S or later, iPod touch 5th generation or later, or iPad 3rd generation or later (including mini). On the Mac side, Apple quietly added support in summer of 2012 for the Mac mini and MacBooks. Made in Italy, US$99.99, EUR79.99 pre-VAT, shipping now. This one definitely makes sense for review, so we’ll be looking at it.